Rock Solid Mates are proud to present a mod of Australian V8's which contains 5 cars from Holden, Ford, Nissan, Mercedes and Volvo. We have built the Holden, Ford, Mercedes and Nissan models from the ground up and have permission to use the Volvo model, although this will be replaced by our own model in the future. We have tried to maintain a high level of detail with our models which can push rFactor close to it's limits with fields over 35 cars. 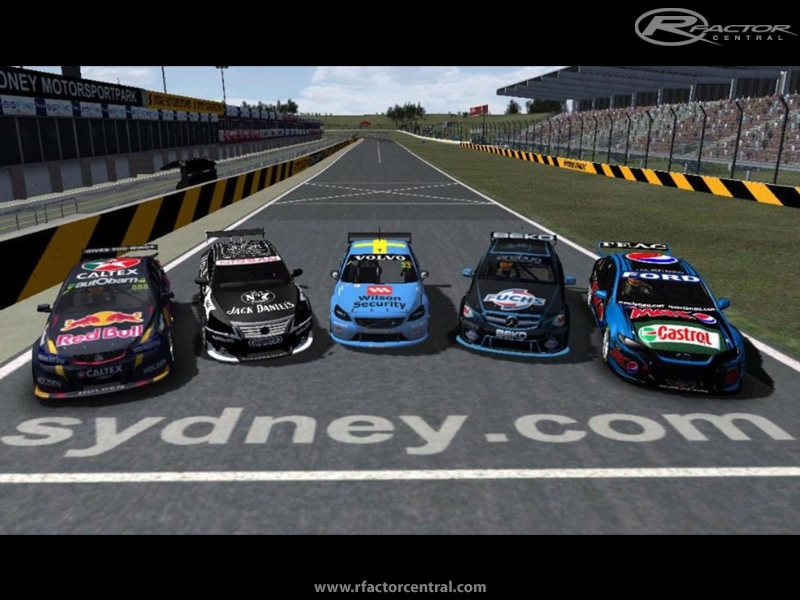 We are in the process of building a skin-pack for the 2015 V8SC liveries which should be finished within the next 2 weeks. We will update the link here when it is available. All constructive feedback on the mod is welcome, be it positive or negative. We have completed the current phase of the 2015 V8 Supercar Skinpack for the RSM Mod v1.0, it includes most skins up until the Jayco Nissan for Winton released this morning. This pack is designed mainly for off-line racing so you can drive against the current real drivers, we have also included Talent Files for a more realistic race. Corrected some errors on liveries, added liveries for recent races. hey guys, mod looks great, just downloaded, will try this in a few days. Are you planning on releasing a track pack? Have the tracks changed since 06-08? Just want to make sure I have all the tracks. Are the rest of the 2015 liveries going to become available soon, or will we have to wait for the 2016 liveries instead or as well as? By the way, absolutely loving the mod so far! Racing Adelaide, Townsville, Gold Coast and of course Bathurst have been extremely fun! I've been a sim racer of V8's for a little under 2 years, especially Unleashed & to a small extent FVR V8's 2012 on RF2. I have had a little play of these so far & the previous mentioned mods do it better. They feel big & heavy & tough to drive, where as these seem light & easy to drive. I haven't done much with the setups yet, so I don't know how to make the car better yet. Mainly they seem to ride the bumps very easily, they seemingly take wacks on walls & there is no effect on the car's drive ability, there's no jerking of the wheel when hitting walls or going over bumps on the brakes. I'll try & sum it up quickly these cars glide over the track more than other V8's mods that I've played. In saying that, I do like the models & the time you guys have taken to make it as good as possible on your first attempt, unlike some others I've heard of. The link is broken, the file doesn't exist. Where can I get this? It looks really good! I have had a look into it and it is your model which we have made some minor changes. I do apologize for not including you in the credits for it but will make sure to include it in future. We accidentally overlooked the crediting of the S60, we were a little rushed when doing the updates and documentation so it was ready for our racing season. I hope you like what we have done with it and appreciate you letting us use it. Looks like my s60, but I can't see where it comes from anywhere... ? Great mod! the cars looks great! although for the next update can you update the interiors a bit, overall this is just wow! oh and can u tune the car sounds a bit thanks! just one more thing are you guys going to update the inside of each car with sponsors?